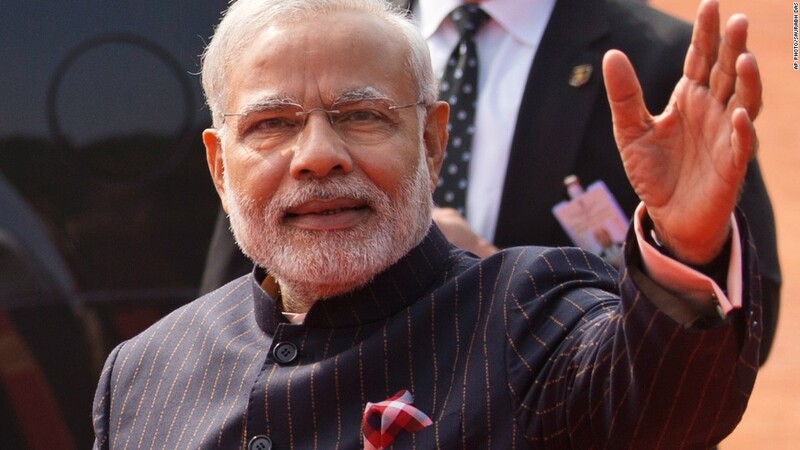 (CNN) Here is a look at the life of India’s Prime Minister Narendra Modi. Entered into an arranged marriage as a teenager to Jashodaben Chimanlal. When he filed his nomination for prime minister, he was forced to acknowledge the marriage after almost 50 years of claiming to be single. Left home in his late teens to travel India, stay in ashrams and wander the Himalayas. Modi uses social media and has both a Twitter and Facebook account. He is the second-most followed world leader on Twitter, behind US President Donald Trump. First prime minister born in independent India. October 3, 1972 – Officially joins the Hindu nationalists organization Rashtriya Swayamsevak Sangh (RSS). June 1975 – Prime Minister Indira Gandhi imposes a period of “emergency.” Indian civil liberties are restricted, media is censored and protesters are arrested. Modi becomes involved in the movement to restore those rights. 1987 – Enters mainstream politics and joins the Bharatiya Janata Party (BJP) one of the two major political parties in India and is elected the BJP’s general secretary of Gujarat, a state in western India. October 3, 1995 – Becomes the national secretary of the BJP, given charge of various states in India. January 5, 1998 – Becomes the national general secretary, a rank above national secretary in the BJP and a more prestigious position. October 2001 – Prime Minister Atal Bihari Vajpayee names him chief minister of Gujarat. February 27, 2002 – A Muslim mob sets fire to a train full of Hindu militants as it pulls out of a station in the city of Godhra, killing and injuring over 100 people. Communal riots erupt in the days following the fire and Modi is accused of condoning the violent protests that kill approximately another 1,000 people. He is never indicted on any of the charges of inciting communal violence. December 2002 – Wins the election for chief minister of Gujarat, after having stepped down following the riots in Godhra. 2005 – The United States declines to issue a diplomatic visa to him on grounds that he was responsible for the Godhra riots in 2002. July 2007 – With 2,063 days in office, Modi becomes the longest serving chief minister in Gujarat, outlasting former chief minister Hitendra Kanaiyalal Desai. December 23, 2007 – Modi is re-elected as chief minister of Gujarat. December 20, 2012 – TheBJP party wins 115 of the 161 seats to head the national government and lands Modi a fourth successive term as chief minister. June 2013 – Modi is chosen as the BJP party leader, andcampaigns for the 2014 general elections. May 20, 2014 -The BJP unanimously wins the general election and becomes the next Indian prime minister. May 26, 2014 – Takes the oath of office as prime minister. September 25, 2014 – The American Justice Center human rights group files a lawsuit against the prime minister for initiating and being complicit in the violence against Muslims in the 2002 Godhra riots. September 27-30, 2014 – Modi makes his first visit to the United States as prime minister, and meets with President Barack Obama. November 5, 2014 – Forbes Magazine ranks him 15th on its list of Most Powerful People. November 16, 2014 – Unveils a statue of Mahatma Gandhi in Brisbane, Australia. December 8, 2014 – Time magazine readers name Modi as Person of the Year in an annual poll. January 15, 2015 – The US dismisses the lawsuit charging Modi with crimes against humanity. January 25-27, 2015 – President Obama becomes the first sitting president to visit India twice. During the three-day visit, Obama and Modi negotiate a civil nuclear deal — a new 10-year defense cooperation agreement between the two countries, and there is much talk about boosting bilateral trade from its current level of around $100 billion a year to $500 billion by 2025. December 25, 2015 – Modi visits Pakistan and meets with Prime Minister Nawaz Sharif. It is the first time an Indian prime minister has visited Pakistan in almost 12 years. June 8, 2016 – Modi, the fifth Indian prime minister to address a joint session of Congress, speaks about the continuing growth of US-India relations. The day before, Modi and President Obama release a joint statement committing to their united global partnership on issues ranging from trade and counterterrorism to nuclear energy and climate change. June 26, 2017 – Meets with US President Donald Trump for the first time, at the White House. July 4, 2017 – Becomes the first Indian Prime Minister to visit Israel, arriving in Tel Aviv as part of a three-day visit to mark 25 years of diplomatic relations between India and Israel.